A monthly Brazilian cinema series consisting of films of recognized cultural, artistic, and social value, each one representative of one of the five regions of Brazil. Other than the premier event, the series will be screened free of charge, with each film introduced by experts in the field who will also engage in post-screening Q&A. The film selected to kick off the series is the new docu-drama "Dear Ambassador" directed by Luiz Fernando Goulart and produced by Joaquim Vaz Carvalho. 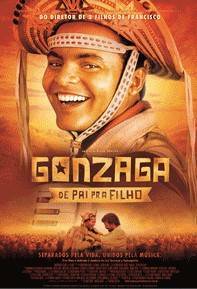 It dramatizes the extraordinary story of Luiz Martins de Souza Dantas, who served as Brazilian Ambassador to Paris during WWII. A largely unsung hero, he defied his own government’s orders by granting hundreds of unauthorized visas to Jews and others facing imminent capture and death. 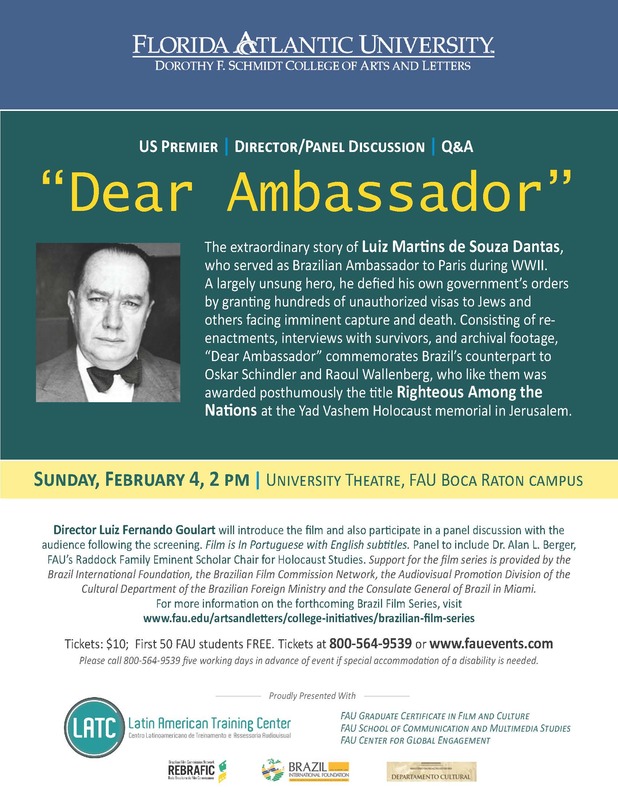 Consisting of reenactments, interviews with survivors, and archival footage, “Dear Ambassador” commemorates Brazil’s counterpart to Oskar Schindler and Raoul Wallenberg, who like them was awarded posthumously the title Righteous Among the Nations at the Yad Vashem Holocaust memorial in Jerusalem. 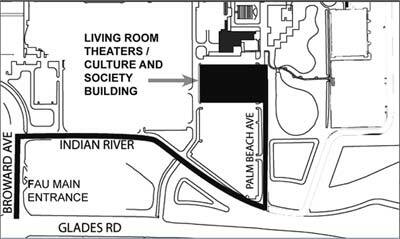 Sunday, February 4, 2 pm, University Theatre, FAU Boca Raton campus. 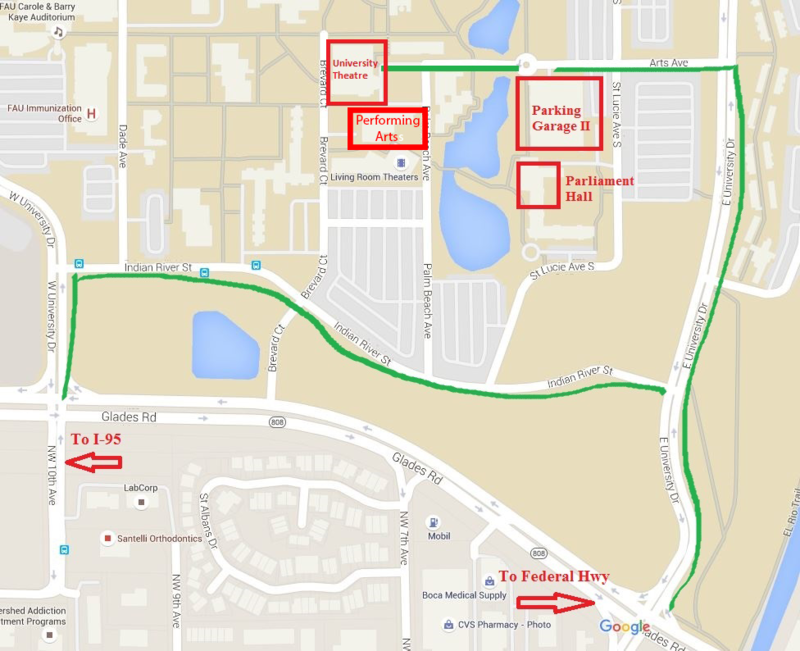 See below for parking/direction details. Tickets: $10; First 50 FAU students FREE. Ticket or www.fauevents.com. Please call 800-564-9539 five working days in advance of event if special accommodation of a disability is needed at 800-564-9539. Proudly presented with the Latin American Training Center, FAU's Graduate Certificate in Film and Culture, FAU's School of Communication and Multimedia Studies, FAU's Center for Global Engagement, and FAU's Certificate for Caribbean and Latin American Studies. 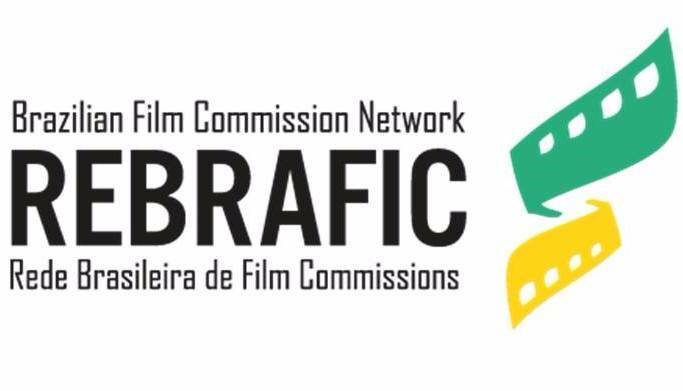 Support for the film and forthcoming series is provided by the Brazil International Foundation, the Brazilian Film Commission Network, the Audiovisual Promotion Division of the Cultural Department of the Brazilian Foreign Ministry and the Consulate General of Brazil in Miami. All films in the series are FREE and open to the public. Synopsis: Zeneida, a young girl of mixed blood, is unique -- more daring, stubborn, and probably the smartest of her ten siblings. But when they move to Marajó Island, she feels suffocated. In constant clashes with her family – and her overbearing father during his intermittent visits – she surrenders to her fantasies, running away with her enigmatic island friend, Antonio. Ultimately, she defies her own demons to wander beyond the path that life had seemingly chosen for her. A captivating performance by the young actress, Carolina Oliveira. Featured presenter: Dr. Michael Horswell, Dean of the FAU Dorothy F. Schmidt College of Arts and Letters, who will introduce the film and lead the post-screening Q&A. Synopsis: Quatrilho is a Brazilian four-card game in which the player has to deceive his partner in order to win. The film follows the story of two Italian immigrant couples living in the state of Rio Grande do Sul in the early 20th century. As they struggle to adjust to an unfamiliar environment, an unexpected love between Massimo and Teresa emerges. Defying family ties and cultural traditions, they head to a new destiny, leaving their partners behind. Featured presenter: Dr. Ilaria Serra, Associate Professor of Italian and Comparative Studies at Florida Atlantic University, who will introduce the film and lead the post-screening Q&A. 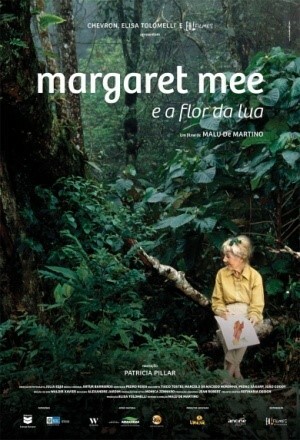 Synopsis: Margaret Mee, a pioneer botanical illustrator, moved to Brazil in the 1950s and used her more than 400 illustrations of Brazilian flora to establish a reputation as one of foremost environmental advocates of her era. This documentary draws on her diaries, interviews and commentaries to reveal a tireless fighter on behalf of the fragile ecosystem in the world’s largest remaining forested area. Featured Presenter: Dr. Johnna Infanti, Climatologist and PACE Postdoctoral Fellow at Florida Atlantic University and the University of Miami, who will introduce the film and lead the post-screening Q&A. 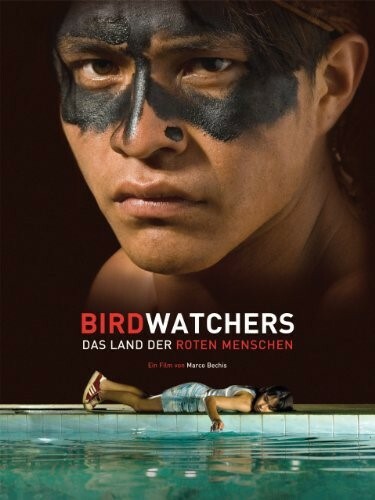 Synopsis: Shot over 10 weeks in 2007, “Birdwatchers” focuses on a group of Guaraní-Kaiowá as they attempt to reclaim their land from a local farmer. While birdwatching tourists enjoy the attentions of a wealthy cattle rancher, the Guaraní-Kaiowá eke out a precarious existence, laboring on sugar cane plantations and living in a shabby squatter settlement. The film courageously documents the contradictory lives of the Guaraní-Kaiowá, who appear engaging in age-old traditions in one moment, but in the next listening to techno music while consuming potent Brazilian rum as an intoxicant. Featured presenter: Dr. Barbara Ganson, Professor of History and Director of the Certificate in Caribbean and Latin American Studies (CLAS) at Florida Atlantic University, who will introduce the film and lead the post-screening Q&A. Synopsis: What literature is to France, music is to Brasil, where poets write lyrics and lyricists wax poetic to contribute to an explosion of popular musical styles. This musical documentary weaves archival footage with discussions of contemporary Brazilian music with some of its great contemporary composers and performers. Featured Presenter: Dr. Joey Bargsten, Associate Professor in Communication and Multimedia Studies at Florida Atlantic University, and interactive multimedia composer/filmmaker, recipient of the 2013 Miami Knight Art Challenge Award, who will introduce the film and lead the post-screening Q&A. Synopsis: Flor misses Vadinho, her spendthrift, philandering husband, who drops dead while dancing in a carnival street party. Flor’s friends persuade her to remarry Teodoro, a respectable pharmacist who is smitten by her. Teodoro is considerate, loyal, the last person to take her savings to enjoy amorous escapades, but he is a crushing bore. Flor begins to pine for the pleasures she once enjoyed, despite her devotion to her new husband. Then, on the anniversary of his death, a naked Vadinho reappears to Flor in her bedroom . . . Featured Presenter: Anthony Guneratne, Professor of Communication and Multimedia Studies, editor of an anthology on film movements that originated in Brazil, Argentina and Cuba, Rethinking Third Cinema, and the director of FAU’s Graduate Certificate in Film and Culture. Principal Cast: Chambinho do Acordeon, Júlio Andrade, Nanda Costa. Synopsis: Separated as much by their political and artistic views as by family circumstances, father and son Luiz Gonzaga and Gonzaguinho proved united in their love of music and love for each other. 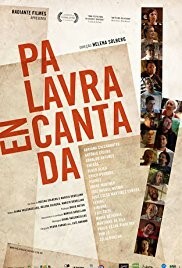 This uniquely Brazilian take on the musical biopic chronicles a family saga that transformed a regional musical form from Pernambuco into a thriving national musical genre. Featured Presenter: FAU Associate Professor of Music Dr. James E. Cunningham is an ethnomusicologist with a strong background in global traditional and popular musics. His interest in Brazilian music is informed by his love of forró, as well as by his 15-year directorship of the FAU Escola de Arts samba ensemble. 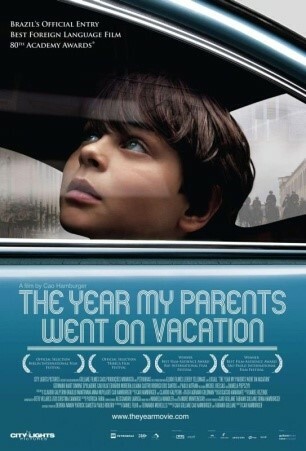 Synopsis: Prior to the 1970 World Cup, Daniel and Miriam suddenly leave Belo Horizonte and drive to São Paulo with their ten-year-old son Mauro, where he will stay with his grandfather Mótel while they go on vacation. They promise to be back in time the Brazilian National Soccer Team´s first game. Mauro waits in front of Mótel´s apartment, but when his next-door-neighbor, Shlomo, arrives, he tells the boy that Mótel died suddenly. The bewildered boy is sheltered by Shlomo and the Jewish community, including a young neighbor, Hanna, who helps him make new friends, even as he watches the military police maneuver on the streets while waiting for his parents to return. Featured presenter: Dr. Myriam Ruthenberg, Professor of Italian at Florida Atlantic University and Cavaliere nell'Ordine della Stella dellla Solidarietà italiana, who will introduce the film and lead the post-screening Q&A.